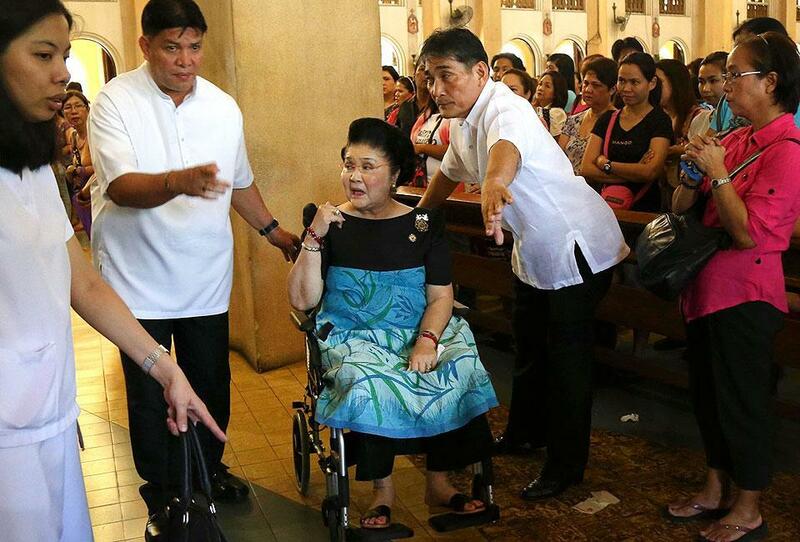 Former First Lady Imelda Marcos found herself in an awkward position on Wednesday when she attended a Mass intended for the victims of the authoritarian rule of her late husband, Ferdinand Marcos. Sitting in a wheelchair in front of the altar of Baclaran Church in Parañaque City, the Ilocos Norte lawmaker heard testimonies of human rights victims and the priest’s homily on the Martial Law regime. Imelda’s presence at the Mass, which was held a day before the 30th anniversary of her family’s ouster from power, was just coincidental, according to the lawmaker’s close-in staff Ricardo Malasa. In a report by GMA News’ Maki Pulido on “24 Oras” on Thursday, Malasa said Imelda always attends Mass at the church, especially on Wednesdays, as she is a devotee of Our Lady of Perpetual Help. “Every Wednesday po talaga kami nagma-Mass doon kasi nagno-novena kami for nine consecutive Wednesdays. Pang-third Wednesday na kami kahapon,” he said. Malasa said they were unaware that the Mass was for Martial Law victims. “Nagtaka po kami kasi sa Mass nagpasaring sa Martial Law. Nung malapit na matapos ‘yung Mass, ang daming media. Hindi namin akalain ganun pala ‘yun. Nung sinabi sa kanya may EDSA event sabi niya (Imelda) ‘Sige lang at may pinagdadasal tayong lahat,'” Malasa added. The Mass was organized by ecumenical group Promotion of Church People’s Response, a member of the Campaign Against the Return of the Marcoses to Malacañang (CARMMA), a movement that calls on voters to reject the candidacy of Senator Ferdinand Marcos Jr. for vice president. The younger Marcos had refused to apologize for massive corruption and human rights abuses of his father’s 20-year regime. Speaking to reporters in Ilocos Norte on February 9, the senator said he will only apologize for any wrong that he may have done against somebody. “That is always my position and I will continue to hold that position,” he said.